The Pro 6000 was for a long time one of if not the best electric toothbrushes on the market, if you desired or needed all the features. A range change in 2016 meant that the new Genius brushes challenged this title. The Pro 6000 still puts up a good fight, but the 8000 takes the top spot. 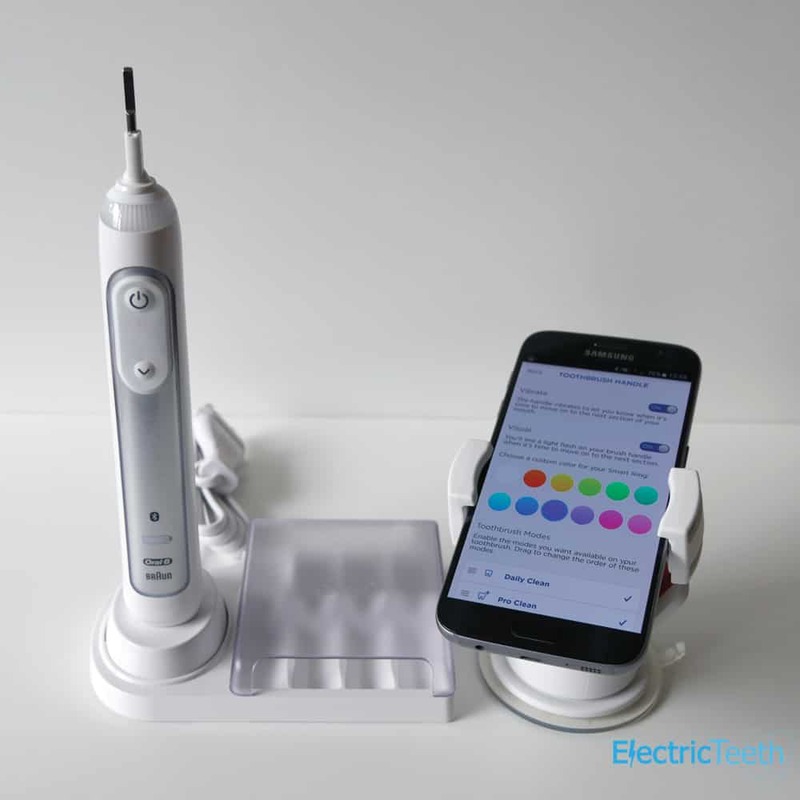 With a refreshed design, slimmer handle, better battery life and new innovations around the tracking of daily cleaning, the 8000 pushes the boundaries on oral healthcare and does what it can to aid you in achieving a healthy mouth. Changes to the box contents means that the 6000 is actually more desirable in some respects, but the Pro 6000 is now much scarcer and tends to be priced similarly to the 8000. If you are going to opt for the 8000, it is well worth making the jump to the Genius 9000, for the extra benefits this brings. The Genius 8000 to some extent replaces the Pro 6000. The Genius 8000 comes with a battery that lasts up to 12 days compared to the 10 of the 6000. The Genius 8000 has a slimmer profile and different design. The Genius 8000 benefits from smarter Bluetooth tracking. The Pro 6000 has a Smart Wireless Guide that the Genius 8000 does not. Both come with 5 cleaning modes, but the Genius has the newer Pro Clean mode. The Pro 6000 comes with 4 brush heads in the box ( 1 x CrossAction, 1 x Sensitive, 1 x FlossAction and 1 x 3D White) compared to the 3 provided with the 8000 (1 x CrossAction, 1 x Sensitive and 1 x 3D White). The Pro 6000 is cheaper. Throughout this comparison I will refer interchangeably to the 6000 as either Pro or SmartSeries. The same brush, a branding change meant that what was originally the Pro 600 became the SmartSeries (due to Bluetooth connectivity). When first launched it was known as the Pro 6000 and had Bluetooth, but as more models came along there was need to revised the naming convention. Detailed Comparison: What’s the difference between the Oral-B SmartSeries 6000 and Genius 8000. 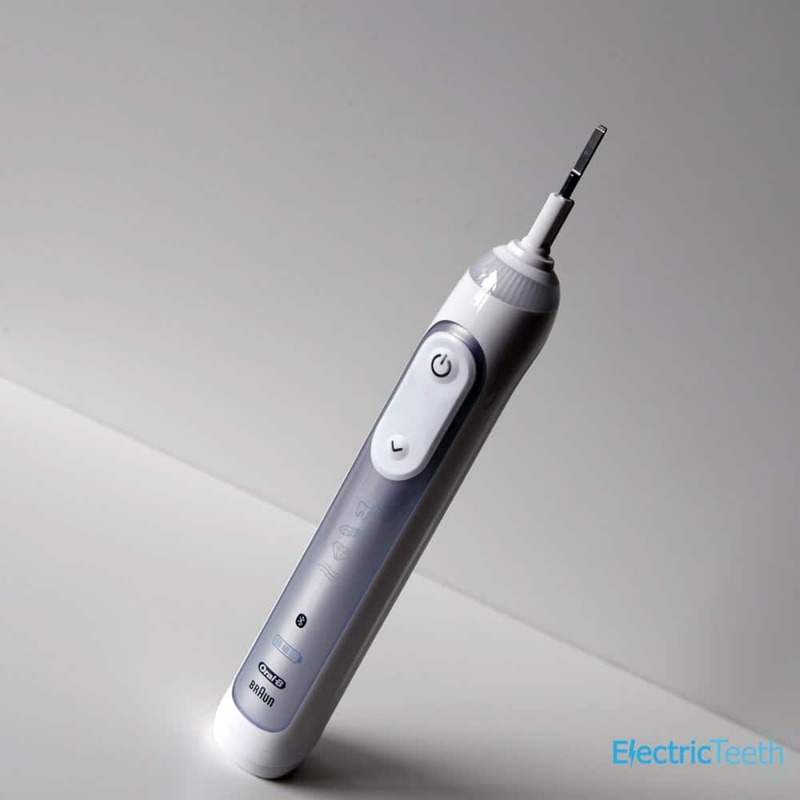 Electric Teeth was founded on the principle of making choosing an electric toothbrush simpler. Hopefully the bullet points above help in achieving this goal, but some like more detail, so here it is. 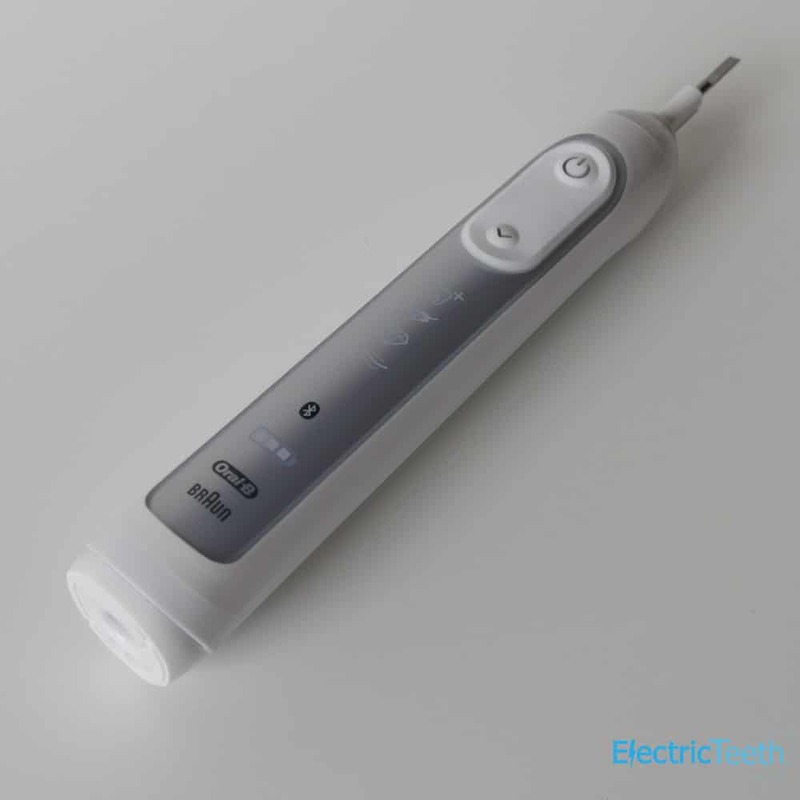 The 6000 and 6500 were until the introduction of the Genius range the most premium electric toothbrushes available from Oral-B. There are some real similarities between the Pro 6000/6500 and the Genius 8000/9000, I almost see them as refresh models. For me, these similarities mean it does not make sense to keep selling all the models alongside one another. One of the biggest criticisms of Oral-B when compared to the competition has been battery life. For a long time, they have been using the cheaper, but perfectly ok Nickel Metal Hydride (NiMH) batteries, but the Genius range are the first in which Lithium-ion, the newer more common battery, (like the one found in your smartphone) is being used. Compared to the 10 day battery life of the Pro 6000, the 8000 benefits from an extra 2 days or an extra 8 minutes of brushing time. This is better, particularly when you consider the slimmer and lighter overall profile of the brush, but it is not the jump in battery life that it should have been and compared to the competition is still relatively weak. If used in a family environment you would still need to charge regularly and you could not last a 2 week holiday without the charger. They do look slightly different too. The 6000 has more rubber on the front to act as a grip with glossy side panels. The 8000’s rubber grip is concentrated to the rear of the brush handle. On the Genius the front panel has icons that illuminate to show the selected cleaning mode, something the 6000 does not show. The LED Smart Ring is a new addition on the Genius range. It doubles up like a pressure sensor, something that the Pro 6000 has, but the Smart Ring is a user customisable LED strip essentially that runs around the top of the brush handle and remains illuminated one of the twelve colours chosen. It will light up red, like the pressure sensor on the SmartSeries 6000 (view on Amazon) when too much pressure is applied. An often overlooked feature on the Pro 6000 which is present too on the Genius 8000 is that at 30 second intervals the pressure sensor will flash green to indicate to change quadrant and then flash 3 times at the end of a clean to indicate this. The same principle is present on the 8000 although the LED Smart Ring remains the colour chosen by the user. It serves no other real purpose other than making the brush more individually appealing and a little more current. Both of these brushes have Bluetooth connectivity built into them, so either can be connected to and Android or iOS smartphone via that app that can be downloaded from the relevant app store. 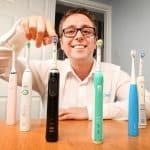 Some see this as a gimmick and an unnecessary requirement but whatever your viewpoint it is an advancement in brushing and fitting with the always connected generations of today. Able to log when and for how low you cleaned as well as how you could improve it can be a really helpful tool in improving your oral health. You need not have the phone within range of the brush every time. In fact both brushes can store data for us to 20 cleans. The difference between the app and the way that it is used with the Pro 600 and the Genius 8000 is what it can do. The 8000 comes supplied with a smartphone holder in the box, the Pro 6000 does not. This holder attaches to a mirror or a tiled surface and within it you mount your smartphone. 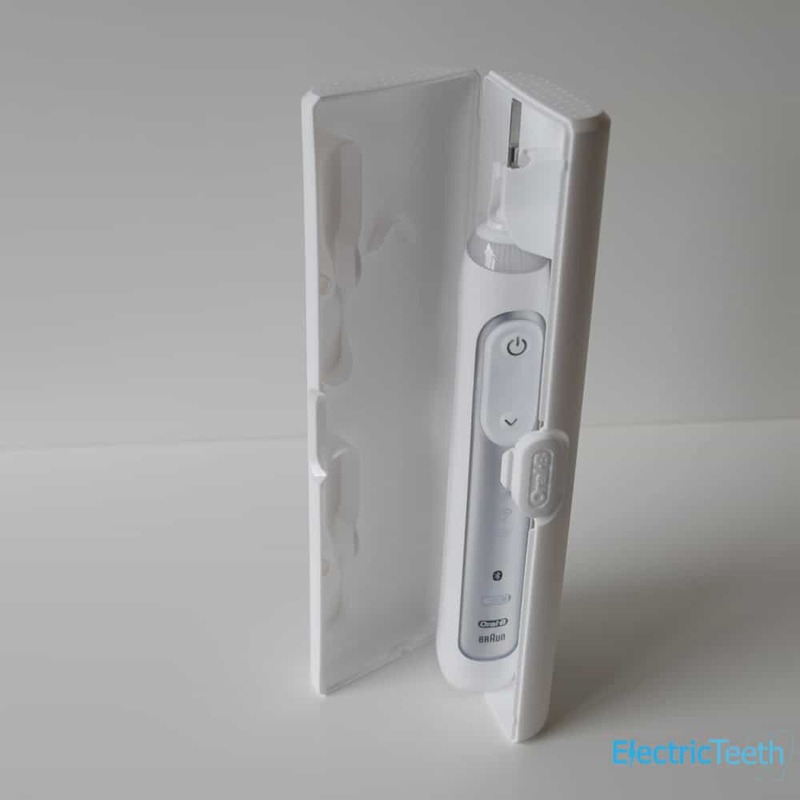 After a bit of setup the front facing camera on the phone along with sensors inside the brush track the movement of the brush in the mouth and in turn give accurate reporting on how well you are cleaning. It is a bit like brushing your teeth in front of a dentist, then having them critique you at the end. Clever it is. A bit time consuming and not always practical it also is. Only those adamant about getting the best dentist like clean at home will likely use regularly. The concept is great, but for many the need for a suction cup phone holder and the alignment with the camera is a step too far. Technically the Genius 8000 setup works better; but the Pro 6000 setup is perhaps more fitting of how most would use. The Genius can work in this way too, just not designed to really. Where the 8000 comes with the smartphone holder, it looses the smart wireless guide that comes with the 6000. Personally I feel this is one of the best accessories to ever be created for a toothbrush, but sadly Oral-B seem to be dropping this from their model range. It is a little oval shaped object that is powered by 2 x AA batteries. It looks like a small clock and acts as this when not in use. This connects to the Pro 6000 when it has been switched on. When running, the display shows how long you have been brushing for, an icon to depict which of the cleaning modes is currently in use as well as a smiley/sad face depending on how good your clean is and finally a star rating, judging the overall clean. Think of it as a little training aid. I can’t really put a price on this. It can be easy to get distracted and think how long have I been brushing for and this tells you. Also the sad or smiley face is a gentle nudge to get it right too. Both brushes have 5 cleaning modes, which is more than enough when a large number of us, stick to just the standard daily clean mode. The Pro 6000 or Genius 8000 are really for those particularly serious about their oral health. Both models have Daily Clean, Gum Care, Sensitive and Whitening. The SmartSeries 6000 then has Deep Clean whilst the 8000 has Pro-Clean. Differences here are that Deep Clean lasts for 3 minutes with the same number of oscillations and pulsations as the standard daily clean, whilst Pro-Clean lasts for the normal 2 minutes but delivers 3,000 more pulsations. Technically the Genius range does deliver more power to the brush head than the 6000 with some of the cleaning modes which does influence the clean but telling the difference is virtually impossible and I feel like we are splitting hairs with this. More info on the different modes can power delivery can be found in our post, Oral-B cleaning modes explained. Whatever cleaning mode you decides to use, you should have a suitable brush head attached. Now, the reality is that any of the 6 different styles of brush head can be used on any of the cleaning modes on either brush, but some are better suited than others. In the box with the 6000, you actually get 1 more brush head than the 8000. There is a FlossAction head that is not provided. The others are CrossAction, Sensitive and 3D White. You may discover more about the various brush head styles in the ultimate guide to Oral-B brush heads. These two powered brushes both come with travel cases. Both are functional cases that hold the brush handle and up to 2 brush heads. The 6000 comes with a basic rounded style case that will do the job, but the 8000’s travel case is more premium. Stronger, thicker, more uniform in its shape, with a better clasp and mounting points for the contents, it’s a bit bulkier but looks better finished in white. Neither are as nice as the case supplied with the 9000. The final difference is the price, both retail and what they actually sell for. SmartSeries 6000 has a retail price of £229.99 but you can get it for 50% less than this most of the time (view on Amazon). It is a similar story with the 8000 which boast a £259.99 retail price, but £110 or less is a more realistic price to pay (view on Amazon). Deals and prices asked are always on the move, generally you will see up to a £40 premium asked for the 8000, but it tends to average at £20 premium. Be sure to pay a price you are comfortable with. However for the benefits of the 8000 a £20 premium is justifiable. The most desirable differences are in my mind the battery life, travel case and enhanced Bluetooth tracking facilities. If you really want the best and are happy to pay more despite the diminishing return on your £; go for the Genius 9000. Those then are they key differences. Naturally there are some similarities. Both brushes share the same charging stand. This is supplied with either model and has a 2 pin connector that attaches to a shaver socket in a bathroom (220-240v). If you do not have one, you can purchase an adapter to allow you to connect it to a conventional 3 pin UK mains socket. A 2 minute timer for the standard daily clean is built in along with the quadpacer which helps ensure you are brushing for the right amount of time. Both come with a moulded plastic brush head storage compartment, complete with lid. Housing up to 4 brush heads, this housing snaps to the charging dock to provide a neat charging and brush head storage solution. For peace of mind both come with a 2 year warranty, which can be extended to 3 years, if you register the brush online. This covers part failure and not things like user damage. No, not that I or any normal person can tell. 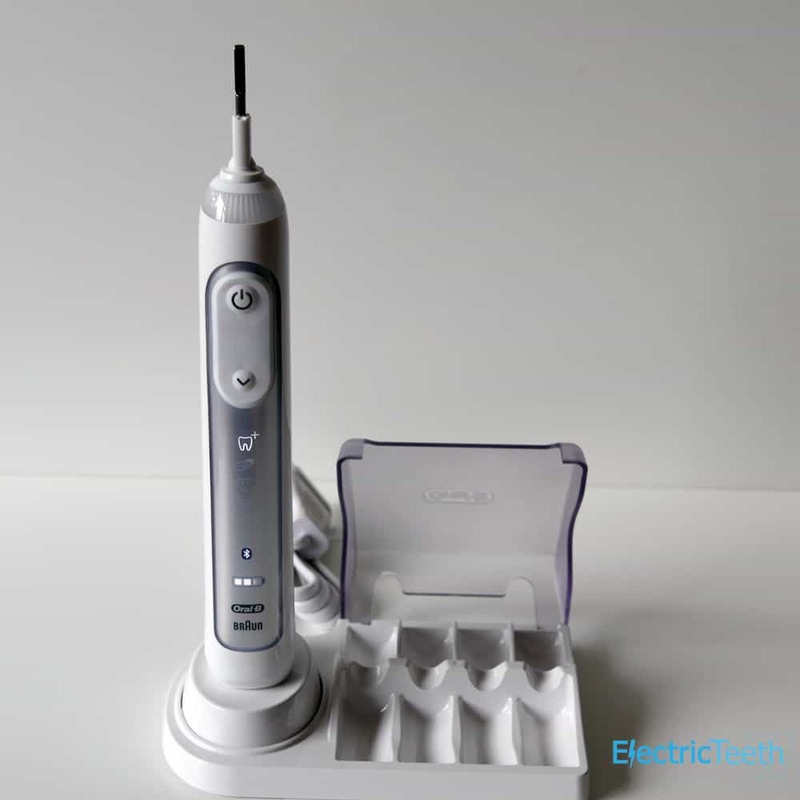 Technically on some cleaning modes the 8000 has more oscillations and pulsations that under scientific conditions could be argued to clean the teeth more thoroughly. However, I defy anyone who can acknowledge this difference both in cleaning experience and results, in the real world. Both brushes do a stellar job of cleaning your teeth and there is no denying over several months of use, if never before used a powered brush like this, you will see improvements. Do be assured that you are using the right technique though. We explain how to clean your teeth. Yes, as mentioned earlier in this comparison, the 6000 is generally more favourably priced. The Genius arguably commands more for being newer and full of more features, but the difference is smaller than it once was and the scarcity of the 6000 appears to be driving the price up of what stock remains. I gave my answer at the start of the comparison to make things easy; my views have not changed here at the end. The Genius 8000 (view on Amazon) is a very good toothbrush and I hope you can see why, based on the explanation of the differences I feel this way. Oral-B SmartSeries 6000 Product Page. Oral-B Genius 8000 Product Page. Buy Oral-B SmartSeries 6000 on Amazon. Buy Oral-B Genius 8000 on Amazon. thank yo very much for your sharing opinion. it is really helpful. The latest model of pro 6000 do come with Lithium-ion battery. I just found out after I read your review. thank you very much. Not sure there is anything on the box that will confirm this. You do have the production date on some boxes. There is only 1 version of the Pro 6000 so whatever you receive should be the ‘latest’. There is the newer Smart 6 6000, but the design and specifications are a bit different.